Violas provide wonderful color in the garden or window boxes in mild winter areas! And in many colder regions they pop back up as soon as snow melts. 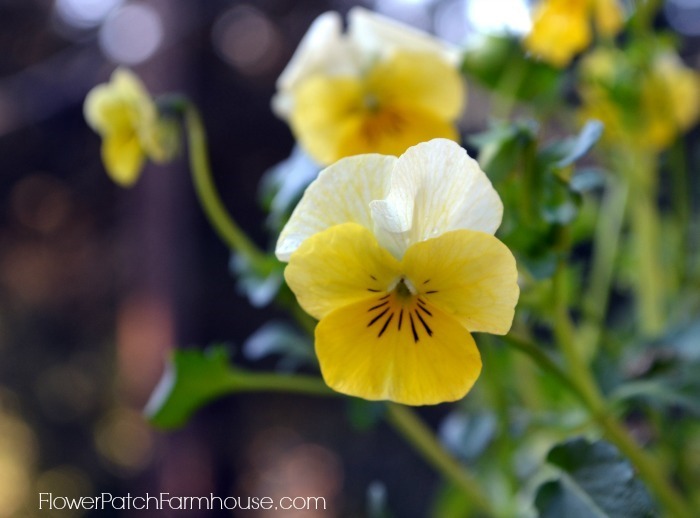 Violas for winter cheer for the flower lover that misses having blooms in mild winter areas. I love Violas, planting them in the Fall guarantees some vibrant, sweet smelling blooms early in Spring. In milder winter areas you will get blooms from them all winter long. They come in so many lovely colors. Violas are a cousin to Pansys but they tend to be more winter hardy and hold up to heat a bit better. Plus the ones I have gotten over the past few years will reseed themselves. I like to line pathways with them so I can smell their sweetness as I walk along. I plant them in Fall, let them snooze under the snow and when temps warm they come to life again. When it is warmer I keep them dead headed for repeated blooms and if they get too leggy I just shear them back to a few inches tall and let them come back. Plant straight in the garden in well amended garden soil next to companion plants that once it gets hot will provide shade. The violas will keep on blooming if watered moderately and given some dappled shade from the larger growing flowers. I enjoy them planted in drifts of a particular color to make a bold statement. But they are charming anyway you prefer. I have read of a variety by Proven Winners called Pansiolas that are supposedly very heat tolerant but I have yet to try them. If you have grown them let me know how you liked them. The violas are beautiful. I was just in Sacramento for 10 days (well the countryside outside Sac) and I know y’all are worrying about the drought. We are at home too but gotta say I sure enjoyed the weather. Since I cannot control the weather I am enjoying it as much as I can. It has been glorious and I shudder when I hear of the cold and in other parts. Pamela, I need to tackle stairs and mine have carpet so even more work! Those carpet tacks and holes yuck! I see you have the risers partially painted so I just bet you are going to paint glorious flowers on each one! I am sure it will be gorgeous. I supposed it would not be hard to guess what I was doing to those steps. 🙂 Actually it was my husbands suggestion and, of course, I did not disagree. I do not envy you pulling up that carpet, ugh. Hard, hard work. I wish I had photos of the before in our house. It had dark, dark blue carpet thru out, even in the bathroom. Hate carpet in a bathroom. I wish you the best with that. Wish I could scoop up some of the white stuff here and plop it right over to ya. I would take it in a heart beat! We need it but I do love the mild temps we have been enjoying. Downside is my roses are already budding and if we were to have a cold snap suddenly it would do major damage to them. I didn’t realize that there were so many varieties! All are just beautiful; thanks for sharing! I was first introduced to tri-color violas as “johnny jump-ups”. We can grow violas and pansies fall through early summer when the heat gets them. Would love to try the new pansiolas so I will be on the lookout for them. Pansies and violas brighten up a dreary winter. Love them! I grew them through the winter when I lived in the San Joaquin valley. I loved that they brought so much lovely flowers to my otherwise drab garden.